It’s that awful moment during November sweeps, or during summer, refreshing your internet feed on twitter and tumblr when you see it- your favorite show has been CANCELED. Saddened and dismayed you take to the internet, posting comments and signing petitions, uploading rants about networks and their executives to YouTube After a few days, sometimes a few weeks in rare occasion, the average person moves on to another show, another fandom. Still, there are always shows that linger in people’s thoughts years after cancellation with fans always hoping that somehow the show will find a resurrection, as Firefly found with Serenity (although lets be honest, most of us would back a Kickstarter campaign to bring the show back in any form), Futurama found with another network, and of course the resurrection of Doctor Who in 2005, now one of the most popular shows in both Britain and the USA. Starring Eliza Dushku fresh off of Buffy, this show portrayed a young woman working at a morgue who when encountering murdered bodies would rewind the last day in order to save them. Reviews for the show were not high, and neither was the fan showing, but Fox still renewed it after its first season thanks to increased ratings in the last few episodes as well as wanting to pair it with a new show they were starting in the fall, Point Pleasant. Unfortunately, after filming six episodes over the summer Fox pulled the plug on Tru Calling, not even airing the filmed episodes for nearly a year and never showing the final episode. The creators of the show did leave something for the fanfic obsessed however- plotlines and future plans of the show were revealed in commentary and interviews that fans have used to write their own seasons. 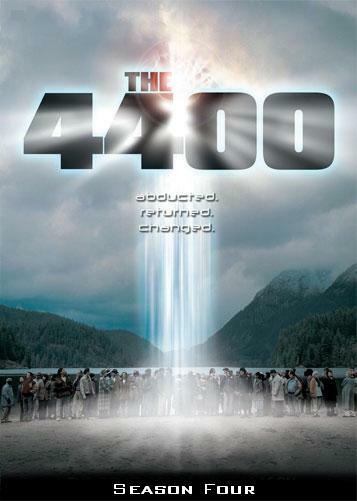 Starting out as a miniseries in 2004, The 4400 quickly became a hit on USA. The show began with the sudden appearance of 4400 people who had gone missing over the last 70 years, most of whom’s families claimed the aliens had taken them. Their sudden appearance is perplexing and unnerving to many. The predominant theory, which was proved to be correct over the course of the show, said that they had been taken from the timeline in order to prevent the future apocalypse. The shows highest ratings were in season two, but did not maintain momentum. After the season finale and cliff-hanger, which still aggravates me, the writer’s strike began and USA decided to just cancel the show then and there. Since the shows end, four books have been written: two set during the show and two trying to conclude it. I don’t know why Sci-fi shows try to get picked up by Fox, it almost never seems to go well. Point Pleasant was originally set to air following the canceled Tru Calling, but aired instead after The OC. Executively produced by Marti Noxon, best known for her work on Buffy, the show was thought to blend the paranormal kick-assery of Buffy with the more Soap Opera style seen in The OC. Point Pleasant centered around a girl who washes up on shore with no memory of who she is or how she got there. Unfortunately, despite her sweetness bad things happen to everyone around her because, as it turns out… she is the daughter of Satan. The show was cancelled two months after the first episode aired, and the final episodes were never shown on TV in America, and can only be seen on DVD. There is good and bad here- while this series was cancelled early, the writers were able to give the story a believable and fairly satisfying ending. It is almost impossible to find and the wait on Netflix can be long. Another Joss Whedon show cancelled long before its time, and another Eliza Dushku series cancelled in its second season, and did I mention it was cancelled by… Fox? Echo, played by Dushku, works as an Active in what is commonly called the “Dollhouse.” Actives are people who have willingly given up their bodies and their minds for a set number of years. With their minds wiped, they are then ingrained with whatever a wealthy client wants. Echo however, slowly starts to develop a consciousness of her own; not that of her original memory, but an entirely new person. As the show progressed, the people and technology used within the house begins to get out of control and the rest of the world starts to interfere- not only using the “dolls” but stealing the technology. The show has two endings, fearing cancellation after season one, Joss wrote an ending; but when it was picked up for the second season this was never aired although still available for viewing on the DVD. The second season was given 13 episodes and not renewed past that, the season aired all of the episodes within two months with back-to-back showings. The series finale was Part II of the original ending- a fast forward to the disastrous results that the Dollhouse technology leaves the world in. A satisfying enough ending, however the show had great potential for incredible storylines within the Actives activities with clients, and the struggle with new technology and those who have it. A spinoff to the popular Battlestar Galactica remake of 2004, this prequel told the story of how humans first created the Cylons that would eventually try to wipe them out. Set two generations before Battlestar Galactica and the Cylon Wars, the show deals with the families of those killed during a religious riot. It is through a scientist’s obsession over his dead daughter, that the idea of bringing any part of her back to life, even if it’s just her persona online consumes him, and begins to bring about the end of humanity. Airing in the beginning of 2010 on SyFy, the show was received well by most critics and had a modest viewership. However, as with many shows on SyFy, the mid season hiatus was too long. Returning in October, the show was met with less than a million views per episode and SyFy pulled it, despite the cliff-hanger left at the end of the season, and plots already in development. ← Community, no not the TV Show.